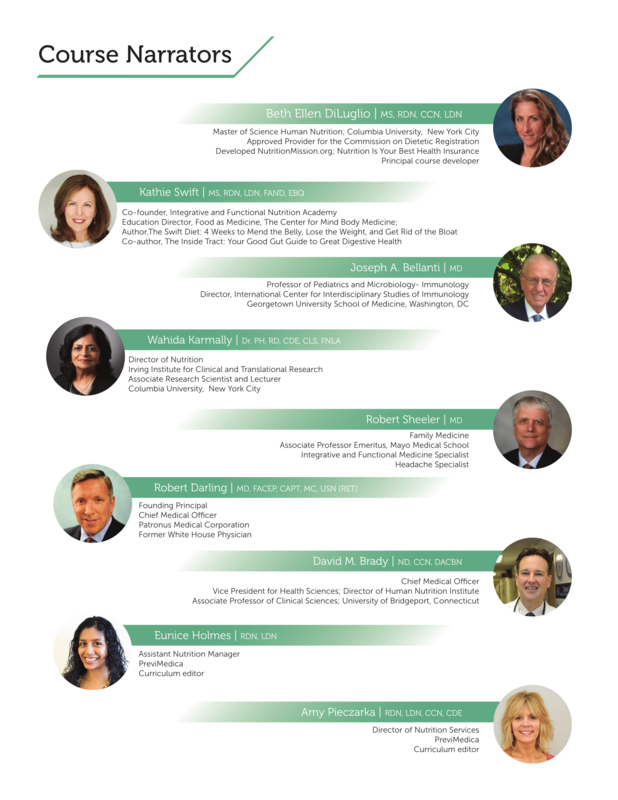 Functional Nutrition Approaches to Gut Health is a comprehensive, self-study curriculum designed to equip practitioners with the knowledge to identify root causes of patients’ digestive symptoms and will provide the insight necessary to choose appropriate strategies for resolving GI issues and promote optimal gut health through nutrition and lifestyle-based interventions. This convenient, on-demand format is designed to allow busy healthcare practitioners to work at their own pace. 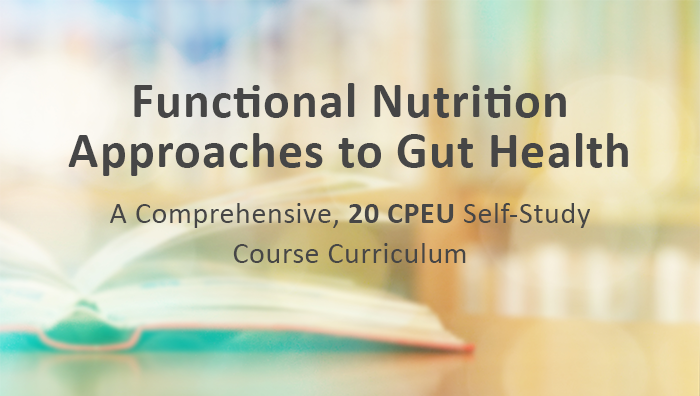 Created and presented by experts in functional nutrition including MDs, NDs, and Doctorate and Master’s level RDNs, practitioners receive the resources, guidance, and support that make evaluation, diagnosis, treatment, and resolution of gastrointestinal disorders less complicated and more effective! Modules include expert-led presentations with accompanying clinical fact sheets (FYIs), reference charts, and cover prevalent GI disorders such as irritable bowel syndrome, inflammatory bowel disease, celiac disease, non-celiac gluten sensitivity, Crohn’s disease, dysbiosis, GERD, FODMAP intolerance, impaired gut permeability, the gut immune system, and adverse food reactions. Overview of the gut-brain axis provides an important foundation for exploring the association between the gut microbiome and brain function, the stress response on mental health and GI function, and the exquisite communication between the GI system and the nervous system. Practical guidelines for testing and identifying causes of GI dysfunction and 5R protocols to resolve issues and restore GI function and health are included in each “What Can Go Wrong” module. Enrollees receive a complimentary copy of Immunology IV, by Joseph A. Bellanti, MD. A list of topics, curriculum outline, and a preview video are posted on the registration page. Describe common gastrointestinal conditions that have a nutritional/functional medicine component. Identify signs, symptoms, and contributing factors for each condition. Explain testing methods available for each condition. Describe 5R guidelines as part of individualized therapy. Identify targeted nutrition support guidelines for each condition. This course is sponsored by PreviMedica and presented by Nutrition Mission™, a Continuing Professional Education (CPE) Accredited Provider (BE001) with the Commission on Dietetic Registration (CDR). I hereby certify that, to the best of my knowledge, no aspect of my current personal or professional circumstance places me in the position of having a conflict of interest with this presentation. I hereby certify that, to the best of my knowledge, neither I (including any member of my immediate family) nor any individual or entity with whom or with which I have a significant working relationship have (has) received something of value from a commercial party related directly or indirectly to the subject of this presentation. AFFILIATION/FINANCIAL INTERESTS CORPORATE ORGANIZATION: Consultant with PreviMedica and Cell Science Systems Beth Ellen DiLuglio, MS, RDN, LDN. View our disclosure policy.